The Department of Justice, the Department of Education, and the Department of Health and Human Services sent a joint letter this week to the nation’s medical schools, dental schools, nursing schools, and other health-related schools regarding hepatitis B discrimination. Citing March 2013 settlement agreements that the Justice Department reached with a medical school and a school of osteopathic medicine resolving allegations that the schools violated the Americans with Disabilities Act by excluding previously-accepted applicants with hepatitis B from their programs (read our related blog post), the Departments express concern that some health-related schools may be making enrollment decisions based on an incorrect understanding of the hepatitis B virus, resulting in unlawful discrimination. 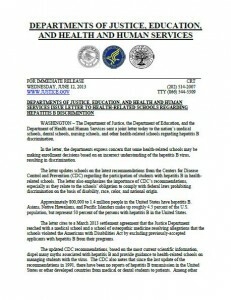 The joint letter reminds the schools about the Updated Recommendations for the Management of Hepatitis B Virus–Infected Health-Care Providers and Students published by the Centers for Disease Control and Prevention (CDC) in a July 2012 MMWR. The letter emphasizes the importance of the CDC’s recommendations, especially as they relate to the schools’ obligation to comply with federal laws prohibiting discrimination on the basis of disability, race, and national origin. Read more in this press release and the joint letter .